Select jewellery can be found on our shop. This lovely grey marl sweatshirt has been uniquely reworked by Sarah, handpainted with a sparkly centre recycled from old fabrics. The sweatshirt is ethically produced with a unisex fit. A totally one off piece we won’t be making more of. Material: cotton Size: L, fits up to UK14 Sarah is 5’4 / 162cm UK8-10 and it sits oversized Care: machine wash at 30 or less. Turn inside out to protect design. Hot iron the paint only through a cotton cloth before first wash to fix. Select jewellery can be found on our shop. This lovely grey marl sweatshirt has been uniquely reworked by Sarah, handpainted with two happy sunflowers. The sweatshirt is ethically produced with a unisex fit. A totally one off piece we won’t be making more of. Material: cotton Size: L, fits up to UK14 Sarah is 5’4 / 162cm UK8-10 and it sits oversized Care: machine wash at 30 or less. Turn inside out to protect design. Hot iron the paint only through a cotton cloth before first wash to fix. Jeans received are in the first photo! Other photos show design and fit 🙂 All Levi's! Shirt and jewellery available separately. A pair of fabulous reworked mid-blue vintage jeans. Painted by hand, by Sarah! As each pair is a reworked thrifted garment they are one-off or limited edition; we can't guarantee there'll ever be another pair again Material: Denim cotton See drop down options for full sizings. Please check measurements carefully before ordering. Size UK16-18. Waist 35”, hips 45”, rise 12” and inside leg 29”. Care: Hot iron through cotton cloth before first wash. Launder inside out at 30 or less. Do not tumble dry. 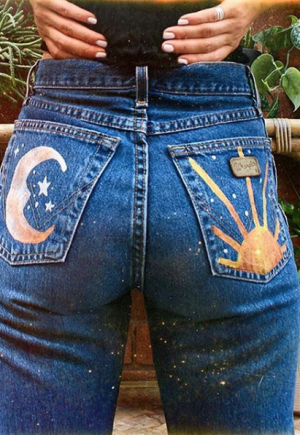 We LOVE vintage denim! This pair of dungarees has been reworked by hand, by Sarah. 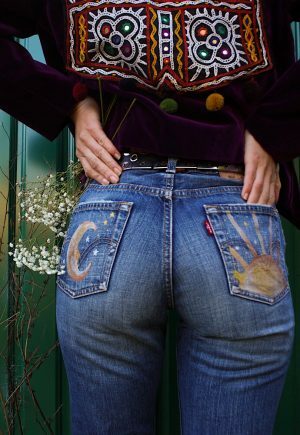 Stunning vintage embroidered and mirrored fabric sewn onto the front pocket gives these a luxurious boho feel. Plus, it makes them almost 100% recycled! Please note these have had repair work on one of the legs with a big patchwork piece, reflected in the price. Material: Denim cotton Fit: Relaxed, adjustable straps Size: UK14-16. Waist 36 inches hips 44 inches, body length 25 inches and inside leg 25 inches but can be unpicked and add another 2 inches. Sarah is 5'4 and a UK8-10 and they are too big CARE: Due to the mirrored fabric we would recommend dry cleaning these. Jeans received are in the first photo! Other photos show design and fit 🙂 All Levi's 501s! Shirt and jewellery available separately. A pair of fabulous reworked mid-blue vintage jeans. Painted by hand, by Sarah! As each pair is a reworked thrifted garment they are one-off or limited edition; we can't guarantee there'll ever be another pair again Material: Denim cotton See drop down options for full sizings. Please check measurements carefully before ordering. Size UK16-18. Waist 35”, hips 45”, rise 12” and inside leg 29”. Care: Hot iron through cotton cloth before first wash. Launder inside out at 30 or less. Do not tumble dry. Jeans colour will be more like the first photo. Other photos show design and fit 🙂 All Levi's 501s! Shirt and jewellery available separately. A pair of fabulous reworked mid-blue vintage jeans. Painted by hand, by Sarah! As each pair is a reworked thrifted garment they are one-off or limited edition; we can't guarantee there'll ever be another pair again! Please note a lower price reflects jeans with slightly more wear and tear (frayed hems, small holes etc). A higher price is for a pair of good quality jeans. Material: Denim cotton See drop down options for full sizings. Please check measurements carefully before ordering. W = Waist H = Hip IL = Inside Leg R = Rise Sarah is 5'4 and a UK8-10 for reference wearing pair 10 which are tight on the legs (oops) Care: Hot iron through cotton cloth before first wash. Launder inside out at 30 or less. Do not tumble dry. Please note garment received is the BLUE one. Other photos of the black jacket show styling only! Jewellery and dress available separately. For you boho beauties, our celestial coat is dreams made reality. Beautiful quality, fully lined with stonewash cotton, with pockets and wooden buttons. The quirky patchwork design is toned down by the muted black colour scheem. We think this will look amazing on women of ALL ages - you're never too old or young to be Adorned. Fairly traded, so by choosing us you're supporting fair and safe working conditions. Smiles all round! Material: 100% cotton, lined Style: Close-fitting around upper body and upper arms, relaxed in the waist and hips Colour: Grey and black Size XS/S UK6-8 chest up to 32", waist 30", arms 12" wide x 21" long and 35" long ONLY TWO AVAILABLE Size M UK10-12 chest up to 33", waist 32", arms 13" wide x 22" long and 36" long ONLY ONE AVAILABLE Size L UK 12-14 chest up to 36", waist 34", arms 14" wide x 22.75" long and 37" long ONLY ONE AVAILABLE Erin is 5'6, UK6-8 wearing the XS/S Styling: Let it stand out by teaming with all black, or go all out hippie with a contrasting patterned dress. Wash: Hand wash only, do not tumble dry All Adorned orders are sent in biodegradable or recyclable packaging!